On the 19th of May, 1783 Henry married Elizabeth, the eldest daughter of the late Richard Smyth, and heiress to a sizeable fortune. 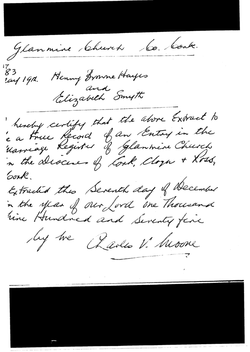 Details of the marriage were entered in the register of Glanmire Church in the Diocese of Cork, Cloyne and Ross, reproduced here and signed by by Charles V. Moore on the 7th December, 1975 . Besides Elizabeth's dowry, further money came his way after his marriage, because it was the practice among the wealthy to “settle” property and income (usually in rents) onto a bridal pair following their marriage. This was usually done by the families of the bride and groom. Glanmire Church in Glanmire where Sir Henry and Elizabeth Smythe were married. Atwell Hayes, Sir Henry's father built 'Vernon Mount' for his wife and his retirement home. 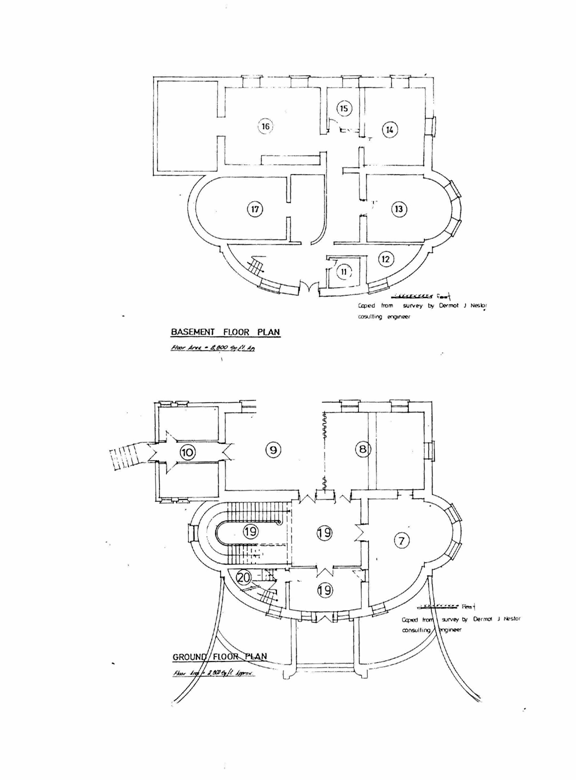 It was a palatial, Freemason inspired villa with many symbolic features in its design. .. Following the death of his wife Mary in 1764, Atwell changed his mind about living in Vernon Mount and leased it to Henry, in 1785. But once Henry moved in, he spent the bulk of Elizabeth’s inheritance on costly furnishings and decorations, notably the painted ceiling, doors and walls. The artist he employed was Nathaniel Grogan, probably a Mason well versed in Masonic symbolism. 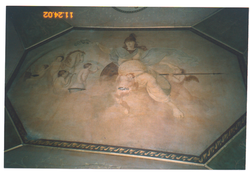 The house and art work inside ‘Vernon Mount' resembled in part Sir Francis Dashwood’s “Friars of St Francis of Wycombe”, the infamous Hell- Fire club because prominently painted on 'Vernon Mount's' curved ceiling is a large ‘agape’ similar to the 'Hell-Fire' club's which looked down on all who passed through its Masonic front door. The agape's central theme is Minerva, the virgin goddess, dressed in full battle armour attended by four muses, the winged horse Pegasus and two cherubic putti,. 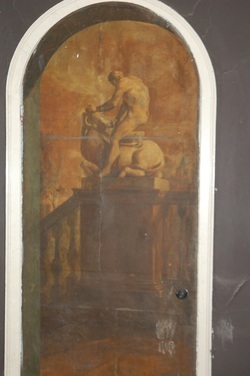 The whole scene is enclosed by an octagonal frame, the symbolic eight side making the painting unmistakeably Freemasonon. Note the Freemason doorway to 'Vernon Mount'. 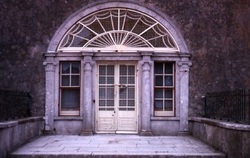 Nearly every architectural structure of the house was designed to be symbolic, from the number of steps along the sweeping stair case to the first floor and the number of columns and number of doors leading to the rooms. Today ‘Vernon Mount’ still stands, a sad building, all boarded up with the roof in a ruinous state. The indoor fixtures and paintings are rapidly deteriorating; a tragic statement of the clash between commercial development and the last vestiges of forgotten history. Some of the steps in the stairs in the plan number 3,4 or 5 ,the length of the sides of the Pythagorean right angled triangle and symbolic. 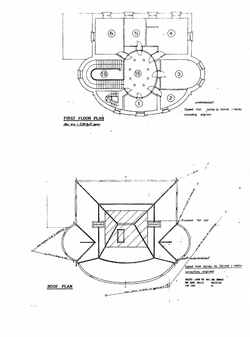 Surrounding the ceiling agape are framed pentagonal panels,the symbolic number 5.. Shown here is the goddess Fortuna or good fortune, holding the horn of Amalthea; she symbolised the plentiful gifts of fortune. 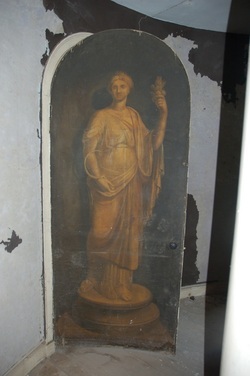 Ceres or Demeter painted on one of the seven doors. In one hand she holds aloft a sheaf of wheat symbolising life, while in the other she holds a sickle symbolising death. 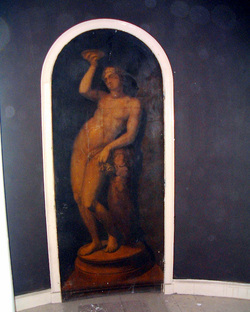 Dionysus or the Roman Bacchus painted on one of the seven doors. In the Dionysiac or Bacchanalian Mysteries, the legend played during the initiation of the Masonic candidate, represents the death of the demi god Dionysus or Bacchus, the search and discovery of his body and his restoration to life. The legend is connected to the Society of Dionysian Architects and is similar to the Masonic General Assembly. 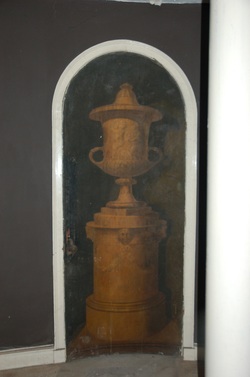 A door, painted with a funeral urn standing on a pedestal,l symbolises death and resurrection. The face of Pluto or Vulcan, the god of forges stares from the pedestal. Painted on the vase is a depiction of a kneeling soul about to be resurrected by a winged god. The first floor with its eight columns and seven doors and 15 stairs are symbolically Freemason. In this panel ,the Archangel Michael is blowing his trumpet announcing the resurrection. He is flanked on either side by a centaur, representing the sign of Sagitarius or the 'Archer' in the Zodiac. The whole scene is enclosed in a pentagonal frame. The adornment of laurel leaves around Michael is associated with poets and is sacred to the sun god Apollo, the great patron of the Arts and the protector of the nine muses. 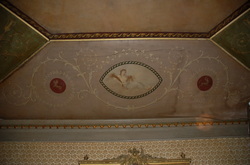 The Nathanial Grogan's agape on the ceiling of Vernon Mount. This painting oozes Freemason symbolism with the Goddess Minerva borrowed from classical Greco/Roman mythology, symbolically expressing Masonic ideals far beyond the uninitiated's understanding. In the agape Minerva is depicted as a voluptuous, full breasted and possibly pregnant Minerva, the complete antithesis of the virgin goddess of war and wisdom. She is depicted here laying down her spear and shield,symbolising the enlightend Minerval stage and that her armour and weapons of protection were no longer needed,the anthisesis of her godly persona. The masonic depiction here parallels the Christian agapes of the Virgin Mary surrounded by angels and saints seen in many of the stately homes. 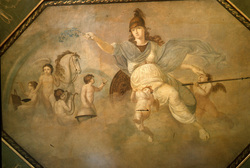 Minerva was revered by the Romans because she assisted Prometheus to steal fire and the knowledge from the gods on Mt. Olympus. This theft of light and warmth enabled primitive mankind to light up darkness and defeat ignorance. The Masonic ‘Illuminati’ or the enlightened ones, took Minerva’s name as in the ‘Minerval’ stage , to designate their introductory stages of initiation. In the agape Minerva is in a stage of yelding up her spears yet holding on to her russet brown shield,covered by Medusa's flayed skin with her face in a frozen scream, stretched over the shield. Medusa symbolises protection, for according to mythology she turned any living creature who looked directly into her eyes into stone . In the painting Minerva wears a blue stole, a Masonic colour. with a winged putti taking a spear from her left hand. She points to four muse in the form of children ,whilst holding a sprig of cassia ,the symbol brought back to Noah's ark by the dove that the flood was over and that life had returned to the world. The white horse with wings is Pegasus, born out of the blood of Medusa’s severed head. The pre-pubescent boy or muse his hand resting on the globe of the world, symbolises the world wide reach of Freemasonry, whilst with the other hand holding an open pair of compasses is pointed at the circular Zodiac, with one pointed arm directed at Cancer and the other is at Leo, indicating divine measurement and thendivision of the world into seasons, further Masonic symbolism. The faces of the childlike Muses are probably Sir Henry's children, whilst Minerva's features probably of his wife Elizabeth. Olaf Maxwell the present owner of' Vernon Mount', dining with me at his favourite restaurant in Cork. 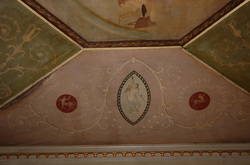 The murals inside Vernon Mount were last seen and photographed in 2005, and when I photographed them were still in good condition. 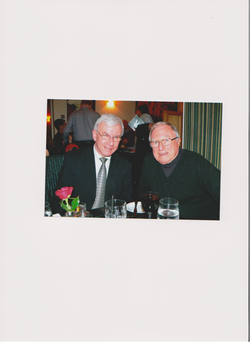 I'm photographed here with Olaf Maxwell, 'Vernon Mount's' owner . 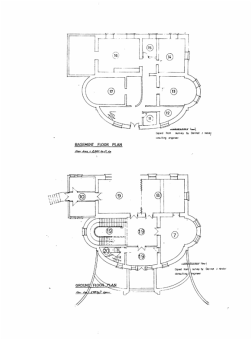 Olaf has indicated to me, that he intends to repair the building and turn it into a tourist destination, similar to that of Sir Henry's 'Vaucluse House" in Sydney. 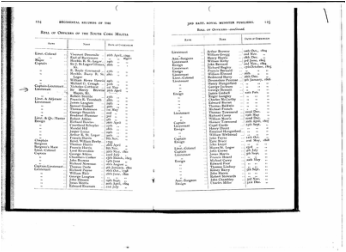 On the 26th April, 1793 Sir Henry was commissioned as a lieutenant in the South Cork Militia. 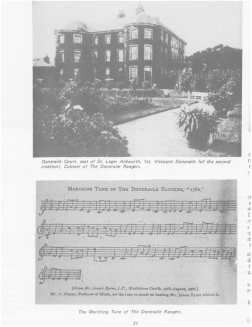 Doneraile Court and the marching tune of the Doneraile Rangers. Atwell had become increasingly concerned with Sir Henry’s wasteful and extravagant lifestyle and in an attempt to keep him in check, restricted his financial help. 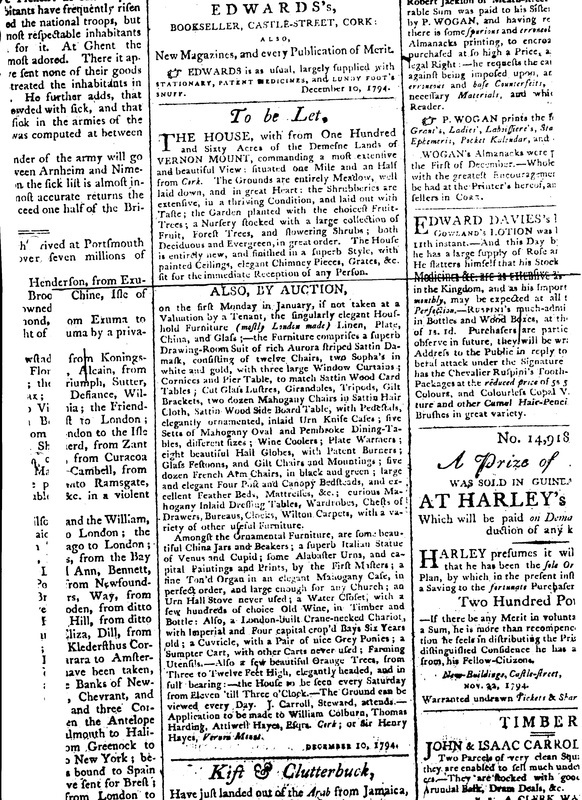 Henry , angry at his father’s latest attempt to interfere in his life, responded by placing this two part advertisement in the ‘Cork Courier’of December 10th 1794, Sir Henry announced that the new house 'Vernon Mount' was to be let together with from 160 acres of meadows, lawns, shrubberies etc.’ The house was described as being ’finished in a superb style, with painted ceilings, elegant chimney pieces, grates’, and if let Sir Henry would auction off his entire household. 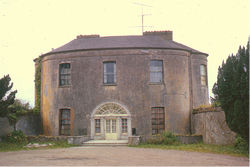 It was a ploy to get money from his father and he succeeded where he announced that the ‘new’ house known as ‘Vernon Mount’ situated about one and a half miles from Cork was to be let. The house of course belonged to his father and Sir Henry had no right to lease it out because he and his family were only there as tenants. 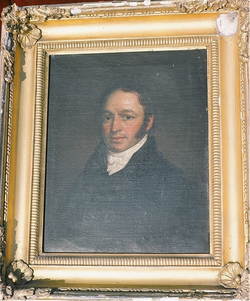 The “or Sir Henry Hayes, Vernon Mount, December 10, 1794”, implied that Sir Henry was still resident at ‘Vernon Mount’ and probably had no intention to leave.